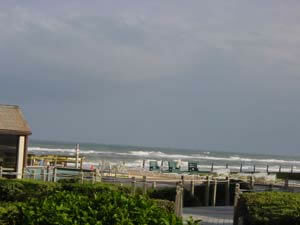 This is a warmly-decorated, first floor, ocean view condo on a wide, non-driving beach. 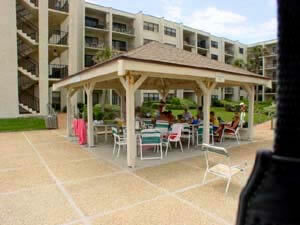 Enjoy your stay in this quaint and charming beach town as you explore the wonderful restaurants and shopping opportunities or just bask in the sunshine at the pool or beach. 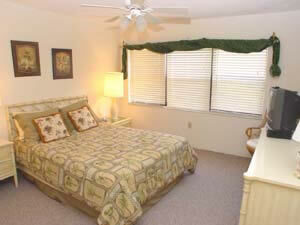 Other Information about the sleeping facilities: Queen Size bed in master with large closet, full-sized dresser, night stand T.V. and ceiling fan. Guest bedroom with twin beds, large closet, full-sized dresser, T.V. VCR combo and ceiling fan. Living room has queen sized futon, TV DVD combo and ceiling fan. Other Information about the bath facilities: Bath and beach towels provided. Other Information about the kitchen/dining facilities: Full kitchen includes new appliances, domed ceiling and ceiling fan. Outside parking next to unit. Park right outside your front door, handicaped or not. 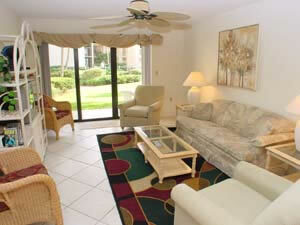 This vacation property is only steps to the pool and beach, through a beautifully landscaped courtyard. 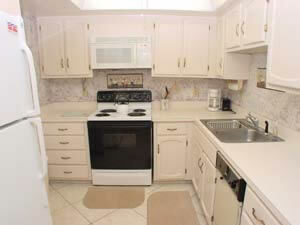 It is conveniently located across the street from shopping and restaurants.